Opa-locka Executive Airport (OPF) is conveniently situated just 20 minutes from Miami International Airport (MIA) and is designated as a reliever to MIA. OPF is also only 10 minutes from Sun Life Stadium, 30 minutes from Miami Beach and 35 minutes from downtown Miami. The airport covers an area of 1,880 acres and contains three runways. In addition, OPF provides full fixed based operator service as well as a variety of aircraft repair and maintenance services. The airport is also known for housing the busiest U.S. Coast Guard Air and Sea Rescue Station. The history of OPF dates back to 1927 when Glenn Curtiss founded the airport on the grounds of his former Florida Aviation Camp. Before his death in 1930, Curtiss gave the grounds to the U.S. Navy where it became part of the U.S. Navy Training Command during World War II. During the Cold War era, OPF played a significant role in civilian and military efforts, and it served as both the Miami Marine Corps Air Station and the Miami Naval Air Station during the Korean War. There are still many historical buildings and aircraft that remain on site at OPF from these historic times. The deed for the airport was signed in 1962, when it transferred ownership to the County and Miami-Dade Aviation Department. Opa-Locka was the world's busiest airport in 1967, conducting more than 650,000 flight operations. 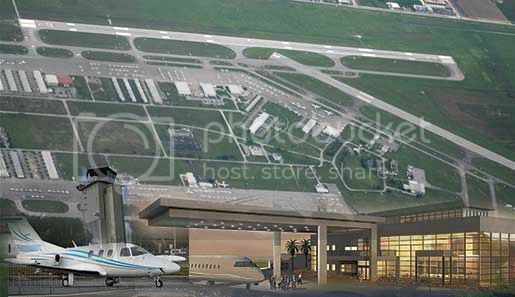 In 2006, the airport's name was officially changed from Opa-Locka Airport to Opa-locka Executive Airport. In 2008, the airport had a total of 108,504 flight operations. OPF currently handles a variety of private and business flights, as well as several cargo and charter airlines that use the U.S. customs facility (U.S. Customs at OPF operates on a daily schedule from 9:00 AM to 9:00 PM). It has one of the longest runways in the country, and can handle practically any type of aircraft. OPF is considered a good neighbor airport, so all aircraft are required to show consideration for the surrounding residential areas. Passengers who require transportation from OPF to MIA can take the South Florida Regional Transportation Authority's Tri-Rail train from the Opa-locka station to the Hialeah Market/Miami Airport station. For other area transportation, travelers can take advantage of Opa-Locka Executive Airport Car Rental services.